Amy S. Evans Hannah was born October 18, 1912 to the Late Rev. William Oscar Evans and the Late Lucretia Marian Berry Evans. She was the 6th of seven children. After graduating from high school, she moved to New York where she worked until she decided to return home and go to college at Fort Valley State College (now Fort Valley State University). Having earned a Bachelor’s degree, her desire for others to also obtain a quality education was strengthened. As a result she dedicated 37½ years to educating children in the Jefferson County School System. For most of her teaching career, she taught 4th grade. Mrs. Hannah was blessed to meet her true soul mate. She enjoyed 58 years of marital bliss with Walter Hannah, a native of Avery, GA. She and Mr. Hannah made their home in Augusta, GA, where she remained until six months after Mr. Hannah’s death on December 31, 2001. While she did not have any biological children, she claims her nieces and nephews, her godchildren, and her many students as her own. Mrs. Hannah joined Lofton A.M.E. Church many years ago when her father was the Pastor for the Lofton Circuit. She has maintained her membership at that church for more than eighty (80) years. 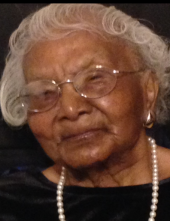 In fact, until her health failed, she was an active member of Lofton A.M.E. Church and a regular visitor at the other churches that were in the Lofton Circuit. Following the death of her husband, Mrs. Hannah resided with two of her nieces (Lucretia Coleman and Salathiel Coleman) in Milledgeville, Georgia. Although time was beginning to take its toll on this amazing lady who lived 106 years, until her death she boldly acknowledged Jesus Christ as her Lord and Savior. Frequently she could be heard praying, singing hymns, and reciting Scriptures. on the month and day of her mother’s birth, April 10, 2019. She was preceded in death by her beloved spouse, her parents, and six brothers and sisters. She is survived by two brothers-in-law: Morris Hannah (Ceola) and Horrace Hannah (Tinnie); two sisters-in-law: Evon Hannah and Marie Lamkin; four nieces: Lucretia Coleman, Salathiel Coleman, Marcia Hannah, and Sarah Evans; four nephews: Ralph Hannah, Barrington Wright, Anthony Hannah, and Morris A. Hannah; three godchildren: Ella Gibbons (Bernard), Myrtle T. Harris (Douglas), and Toya Gibbons-Woodard (Craig); three devoted personal care attendants: Mary Parham, Jeanette Brown, and Luteaoue Hilson. To send flowers or a remembrance gift to the family of Amy Superior Evans-Hannah, please visit our Tribute Store. "Email Address" would like to share the life celebration of Amy Superior Evans-Hannah. Click on the "link" to go to share a favorite memory or leave a condolence message for the family.